As for the Pierateers, we are ready and waiting for probably the biggest British Pie Week yet! We've made Pie Pledges for this week, showing our commitment to pie, plus this year the British Pie Awards 2017 are once again taking place in British Pie Week! We'll be there as media to cover the event, alongside our Com-pie-tition winners as judges! It seems this year, more than any before, people are bigging up British Pie Week. Plenty of pubs and shops are doing something special for British Pie Week... but weirdly the pastry company who invented British Pie Week (to sell more pastry) have decided to ditch it! The end result of which is this... Pierate Pie Reviews are the new home of British Pie Week!!! You may have already spotted if you read the Independent online that our Birmingham Pie Night has made the list for "The best five places to celebrate across the country" this British Pie Week! We can't wait to get stuck in and enjoy the pies that the Jekyll n Hyde provide on Monday evening! 3) Organise a pie night - which is what is happening on Monday evening in Birmingham! As for this morning, I woke up listening to Chris Evans talking pie on BBC Radio 2 and was then delighted to be contacted by BBC Radio Leeds to do an interview! I explained our seven Cs pie rating system, that a pie should be fully encased in pastry and that our number 1 pie is from MyPie London. We're actually going to be heading to Leeds to rate pie this weekend too! But the big event of day one was our Birmingham Pie Night, which kicked off after work at 5:30pm! We were wonderfully hosted by Jekyll and Hyde and loved sharing some stories of pie rating with our guests - alongside eating some top pies! More pics and a review to follow in the coming days. 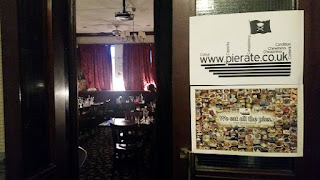 The Jekyll n Hyde hosted our fantastic Pierate Pie Night! 3) Do the "Triple Pie-thagorus" one day in Leeds (eating a pie for starter, main course and dessert for every meal in one day). Today I informed many of my work colleagues that it was British Pie Week, which inspired a lively debate about exactly what constituted a "pie". Naturally the discussion covered the contentious pie vs pasty debate, lidded pies, and to what extent a steak and kidney pudding was a pie. This was an enjoyable discussion and it was delightful to see so many of my colleagues genuinely interested in pies. Having debated the border between pies and non-pies over lunch, it was only right that the pie I enjoyed in the evening was a slice of previously un-rated Waitrose Apple and Blackberry lattice pie. Lattice pies are interesting because they are not fully lidded pies - in fact, they'd be rejected by the British Pie Awards. Here on Pierate we do accept lattice pies as a 'true' pie, but if we had a choice between a lattice pie and a regular pie, we'd certainly choose a regular pie.